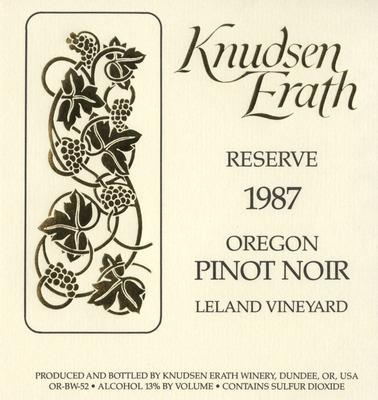 This wine label from Knudsen Erath Winery describes its 1987 Reserve Oregon Pinot Noir produced from the Leland Vineyard. Knudsen Erath Winery, "Knudsen Erath Winery 1987 Oregon Pinot Noir (Leland) Wine Label" (1987). Erath Winery Photos. Image. Submission 43.